For your little ones who are nervous of the dark, Lumilove Nightlights provide a comforting buddy at bedtime. 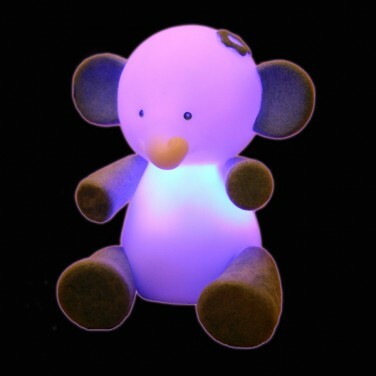 These cute little creatures glow gently by your child's bedside to banish the dark and night time fears, plus their friendly demeanour adds extra reassurance, and their gradually changing colour brings a touch of fun! Their tummies gently glow and change to a variety of beautiful colours, from red to orange to pink etc. Their arms and legs can be moved so they can sit or stand. Simple to use, they are plugged into the mains during the day to charge them up and then, unplugged they last for 8 hours with no wires or batteries. The low-energy LED will not become hot so they are perfectly safe for your little one to pick up if they want to get up in the night.